Though not found there at the present day this typical bog plant has been discovered in Late Glacial beds at Hailes and Corstorphine near Edinburgh. At the present time it is found in the North Temperate and Arctic Zones in Arctic and Alpine Europe (not in Greece or in Turkey), Siberia, N. America. In Great Britain it is found in N. Somerset, W. Norfolk, Hunts, Stafford, Salop, Glamorgan, Cardigan, N. Wales, except in Montgomery, Merioneth, and Angle-sea; Derby; in the Mersey province except Mid Lancs; in the Humber province except in S.E. and N.W. York, Northumberland; in the Lakes province except in the Isle of Man; in the E. Lowlands except in Wigtown, Roxburgh, W. Perth, Edinburgh, Stirling, and Ebudes. It is local in Ireland. Wild Rosemary is a bog plant which is at home only in those few tracts where peat bogs still exist. It is owing to drainage that they are becoming more and more scarce year by year. Wild Rosemary is found in the same habitats as the Sundew, Butterwort, Bladderwort, Bog Myrtle, and the Asphodels. The plant is an evergreen shrub, with a trailing, slender, leafy stem, which is woody, and rooting at the base. The leaves are lance-shaped, alternate, rolled back,1 bluish-white beneath, smooth, and stalked. The flowers are in terminal clusters, drooping, pink, the flower-stalks much longer than the flowers, which have 4 sepals, and a rounded corolla with 5 lobes, turned back. The capsule is erect, with egg-shaped seeds, which are made up of 5 lobes. The berries are edible. The plant is not usually more than, and usually much less than, 2 ft. high. It is in flower from May to September, the berries maturing late in the autumn. It is a shrub which may be propagated by layers. 1 This is an adaptation to the physiologically dry conditions, as in other heath plants, and to prevent the stomata on the under side from being filled with water and so prevent respiration or breathing. With its drooping flowers, which are small and purple, it is not very conspicuous. The stamens are ten in number, and not longer than the corolla, the filaments are bearded, and the short anthers are awned. The style is not divided into lobes, but the stigma is blunt or dilated, and the floral mechanism is much like that in Vaccinium and Oxycoccus. The capsule splits up into 5 valves, and the seeds fall out and are blown away also by the wind. Like other heath and bog plants this is a peat-loving plant, and grows in a peat soil. The fungi Rhytisma andromedoe and Exobasidium andromedoe attack Rosemary. Andromeda, a name given by Linnaeus, is from Andromeda, a beautiful woman in mythology, daughter of Cepheus, king of Ethiopia; and the second Latin name refers to the polished leaves. This rare plant is called Marsh Holy Rose, Moor-wort, Marsh and Wild Rosemary. The name Rosemary is given because it was formerly placed with the Rosemary group. "Who passeth by the rosemarie And careth not to take a spraye, For woman's love no care has he, Nor shall he though he live for aye". "While rosemary flourishes the lady rules". "To show their love the neighbours far and near Follow'd with wistful look the damsel's bier; Sprigg'd rosemary the lads and lasses bore, While dismally the parson walked before". Gay writes of Rosemary sprinkled on graves. 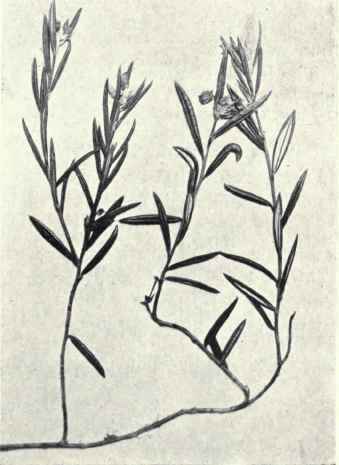 Formerly it was much used at funerals and weddings, and garlands of Rosemary were laid on the biers of unhappy lovers. "Rosemary is for remembrance Between us day and night, Wishing that I may always have You present in my sight". Ophelia in Hamlet, addressing Laertes, says (Act IV, Sc. 5): "There's rosemary, that's for remembrance". "and they mixed it with water in which she bathed three times a day, taking care to anoint her head with ' gode balm ' afterwards. Soon her old flesh came away, and she became so young, fresh, and tender she soon began to look out for a husband". Probably many of these refer to Rosmarinus. Essential Specific Characters: 192. Andromeda polifolia, L. - Small evergreen shrub, stem filiform, woody, rigid, branched, leaves lanceolate, acute, alternate, margins revolute, glaucous below, flowers rose-purple, in drooping raceme, terminal, tufted, fruit a dry berry.